Every now and again I feel like a fresh slice of summer. 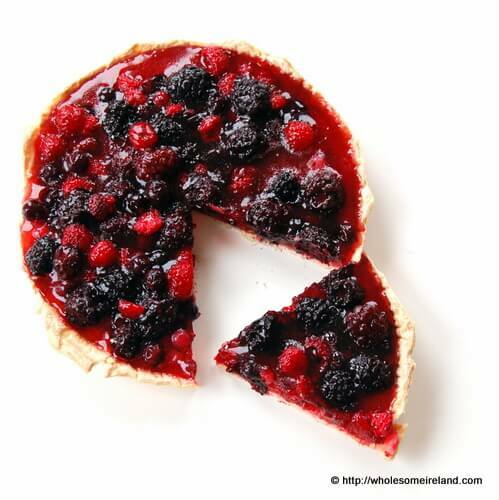 This is a cheat’s way to create a summer berry tart, anytime of the year. Summer berries are precious. Once you harvest those little parcels of sunshine you should either eat them or freeze them straight away. If you have a glut then a quick rinse in cold water then freezing them is the way to go. This summer hasn’t been great for berries but I’m hoping that the local blackberries will improve my freezer stash. The beauty of this tart is that once you have berries in your freezer then it can be made all year around in a short amount of time. 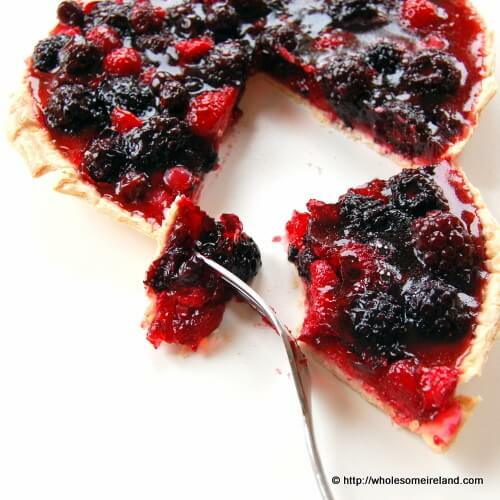 You can prepare and serve the tart within 20 minutes if you have a prebaked or bought pastry shell. This means it’s perfect dinner party or Christmas material. It is also low on processed sugars as you don’t sweeten any of the fruit. A short, but sweet recipe from me today, as the 3 year old starts Naoínra this week. Don’t forget there are 2 competitions still running on the blog. You can enter a competition to win a lovely hamper from Keogh’s Farm, or you could decide to challenge your baking skills and bake along with the Great Irish Bake Off Challenge. Place the flan or tart shell onto the large plate. Cut (or tear) the jelly into at least 9 chunks and place into the jug. Cover the jelly with 150ml of water. Carefully remove the jug from the microwave and stir until the jelly is completely dissolved. Pour the frozen fruit into the jug and mix well so that every berry is coated with jelly. You will know this is done when they become glossy. Pour the fruit and jelly mixture into the shell, making sure that it is evenly covered. Leave at room temperature for 15 minutes. The frozen fruit will accelerate the setting time of the jelly. Serve with a spoon of fresh cream, or natural yoghurt.